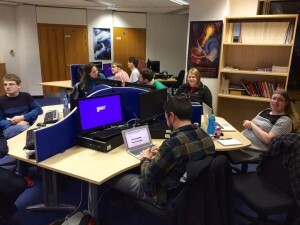 There was a great vibe this January; our first meeting of 2015. Paul Williams opened the year with a great session introducing Git. The session served as a useful introduction to those new to Git as a version control mechanism and incorporated rebasing techniques for those with intermediate skills. We experienced a wide spread of issues related to version control; what else would you expect with up to 20 people trying to do the initial commit? We also had a sneak peak how others are using Git in professional ventures. It was a great fun! 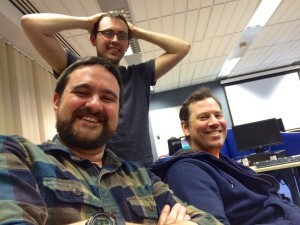 Agile Staffordshire enjoyed an enthusiastic turnout; it was lovely to see everyone. Thank you, Paul. The session provoked some good discussion and even set the scene for our first quarter topics. 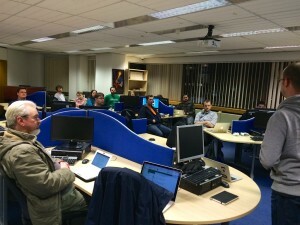 In March 2015, Agile Staffordshire will hold a session on Vi (the editor that appeared mercilessly upon commits) and more advanced Git techniques in April 2015. February’s session will focus on project management, with a specific discussion on Kanban in relation to software development. Keep watching our blog for upcoming events or join our meet-up group. Ad-hoc team trying to commit to repositories in ad-hoc ways! What could go wrong? Not much really! It’s amazing how a bit of Git can make people smile. I would like to add special thanks to Staffordshire University for hosting our event and providing wireless Internet connectivity throughout the session. Super stuff! Another special mention to Mel for taking photographs! This entry was posted on Saturday, February 14th, 2015 at 7:15 pm	and is filed under Agile, Experiences, Meeting, Retrospectives. You can follow any comments to this entry through the RSS 2.0 feed. You can leave a comment, or trackback.